While they might not be visible at first glance, artist Rob Mullholland’s mysterious mirror sculptures address the human race’s effect on the environment in a very literal way. Created in cooperation with Scotland’s Forestry Commission, Mullholland's “Vestige” consists of human-shaped mirrors positioned around the forest floor, reflecting and refracting the Scottish timber and leaves. Mullholland scouted the forest of Aberfoyle, Trossachs, which attracts around 250,000 visitors each year. In years past, the idyllic forest was a roaming grounds for sheep farms and other elements of historic rural communities and was fresh and untouched. The networks of trees were planted after World War One to provide lumber for post-war Great Britain, wiping out the farmland and its inhabitants. Playing on the rich history of the area, Mullholland’s Vestige repopulates the forest with spirits of the feudal Scottish farmers who once roamed with their sheep there. Six mirrored figures are placed amidst the foliage and trees. They appear as eerie silhouettes, visible from some angles and blending in entirely with the forest from other vantage points. The mirrors reflect and amplify the forest, while also giving little hints of their humanistic outline. 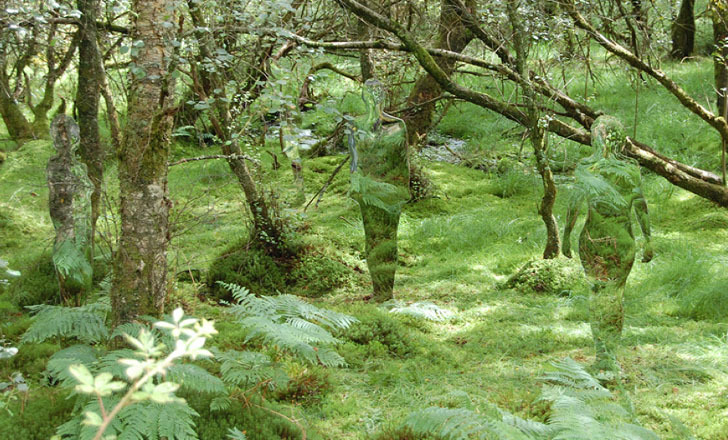 The interplay between the person-shaped forms and reflections of the forest also make onlookers consider their relationship with and impact on the forest and the environment. The popular installation was so well received that Mullholland was commissioned to create six more mirrored sculptures to be permanently installed within the forest’s confines for hikers to discover on their walks through the terrain. The new installation was just completed, and is expected to stand within the forest for at least ten years. How to make a fisker karma even greener? Give it to Justin Bieber then park it in the forest! A picture is worth a thousand words.I never seen this site before you posted the link.Nice one! Mullholland scouted the forest of Aberfoyle, Trossachs, for its popularity and frequent hikers, attracting around 250,000 visitors each year. In years past, the idyllic forest was the roaming grounds for sheep farms and other elements of historic rural communities, fresh and untouched. 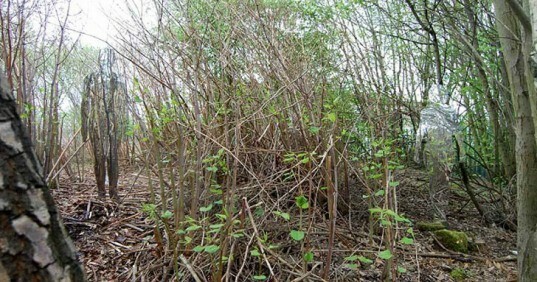 The networks of trees were planted after World War One to provide lumber for post-war United Kingdom, wiping out the farmland and its inhabitants. Playing on the rich history of the area, Mullholland’s Vestige repopulates the forest with spirits of the feudal Scottish farmers who once roamed with their sheep there. Six mirrored figures are placed amidst the foliage and trees. They appear as eerie silhouettes, visible from some angles and blending in entirely with the forest from other vantage points. The mirrors reflect and amplify the forest, while also giving little hints of their humanistic outline. The interplay between the person shaped forms and reflections of the forest also make onlookers consider their relationship with and impact on the forest and the environment. The popular installation was so well received that Mullholland was commission to create six more mirrored sculptures, to be permanently installed within the forest’s confines for hikers to discover on their walks through the terrain. The new installation was just completed, and is expected to stand within the forest for at least ten years.